Good morning, and welcome! 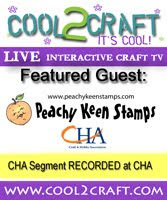 Today, we're celebrating a new release at Peachy Keen Stamps, and this is one special release, so without further delay, let's get hoppin'!!! If you arrived here from our honoree Viv's Blog, then you're on the right track. If not, then you'll want to go back to the beginning at the Peachy Keen Challenge blog, so that you don't miss one wonderful creation! The stamp set available for the first time ever today is called Vivienne and Friends, and was created in honor of our very special DT member Vivienne Holden. I can't begin to tell you what a blessing is it to serve on this design team with such a fantastic lady. I wish I could count how many times one of Viv's emails has brought a smile to my face, or an outright burst of laughter to the room, and I can't think of a better person to celebrate with such a special honor as having her very own stamp set. The inspiration and joy she brings to so many of us should be celebrated each and every day!! Our fearless leader, Kathy, has outdone herself this time with this adorable stamp set, which includes Miss Vivienne, along with some oh so cute friends for her to play with and a great assortment of sentiments. Both of my cards were made with scraps from my scrap paper bag. Gotta love those scraps!! I colored the images with my Copics, and had a ball with embellishments. I hope you likey!! Oh, and before you leave, be sure to leave a comment on this post, because I'll be drawing the name of one lucky commenter for a blog candy grab bag (which will include at least 1 stamp, and a variety of card making goodies). Be sure to include your contact info so that I can let you know when you win! :) Thanks so much for hopping along with us today in celebration of our Viv! Have a glorious day and happy stamping! How adorable! Your work is amazing;)TFS. Your card is SO adorable!! I am just getting started with Copics and you have totally inspired me! Thank you! You can reach me through my blog! Lorie, my lovely friend, you've done me and Kathy proud today. I LOVE your cards. How clever to combine Harvey with the truck! Brilliant! Your cards are sooooo cute! Love the 1st one where you worked in the puppy and the pull toy! Oh Lorie, you had me at "sneak peak", lol! I couldn't wait to see what gorgeous creation you've made with that purple bow peeking at us - this is darling! Such vivid colors, perfect papers to match and what cutie images! This is oustanding - as always! Muah! You all are makin this very hard to choose between these cards because they are also cute but the Viv with the doll and dog would be my first choice. SO cute!! These stamps are adorable! I am loving the ones I have seen so far! Thanks for sharing! Love your cards and love those stamps! They are so cute!! Oh Lorie...I am just running out of words here. I am blown away by your creations. My favorite is the first one...its so detailed. You truly do make PK proud! Wonder how I could convince you to have a PK seminar and come to teach me your skills???? Oh my goodness! These are soooo adorable! Me likey what you have done with the scrapies! LOL What a great job! Lori, OMG! She is the cutiest! I love your coloring! Can't wait to get her! How adorable. This stamp set is just so sweet. I love the way you incorporated the wagon, and the dog, how creative. I would love to win one of these stamps! It is definetly on my wish list! TFS. Your coloring is fantastic! Love your cards. Thanks for the chance to win. This is so fun :). Thanks for the chance to win and have a great day. Your cards were just gorgeous! I can feel the LOVE and I know Viv is too! those cards are so cute and I cant wait to make some of my own! Love your cards I really love the purple, purple is my fav color. Both cards are top notch! I of course love the paper pieced dress. Just beautiful! You make coloring look so effortless, I want to color like you! I will just have to sit back and dream. Lorie, WOW....your cards are so cute. I am so happy I finally got to go on a hop. Love your cards. Thanks for sharing them! Great cards. They are AWESOME! Love the stamps. You did a great job. Thank you for sharing! What an adorable card! Colored beautifully, too, I might add! These are the cutest stamps ever!! Your cards are awesome! OMG!! Lorie, you are the BOMB!! YOUR COLORING My Friend is AMAZING!!! I just might bring my copic markers to CHA so you can sign the container it comes in!! lol... YouR work is SOOO beautiful I just ADORE EVERYTHING you create!! Cute card! I am loving this stamp set!! This is just the cutest set and everyone does such a wonderful job with the coloring--I would have to work on that! Amazing cards as always sweet Lorie! I'm always amazed that your love of life and cheerfulness comes shining thru in your art. Very very cute. Must love using scraps--I just organized my scraps and am having a blast using them. Sorry Lorie, I forgot to leave my contact details! Love your cards - they are beautiful! Both of your cards are SO sweet! I love how you did the leash in the 1st card! It's amazing how different the cards are, using the same stamp set! Great inspiration! How adorable. I love these stamps. I am in love with this new stamp set - and you have done a lovely job showcasing it. I love the how you combined the stamps together. Love both of your cards!!! I love how you added the flowers to her dress. Your cards are great, but I especially like the first one. This new stamp set is so cute! Awesome creations too; you are so talented! Thank you so much for the giveaway opportunity! I hope I'm the big winner!!!! So sweet! What an honor for Viv. Thanks for the opportunity to win some Blog Candy!! Both of your cards are adorable! I really like this stamp set, I am putting it on my wish list. Thanks for the chance to win! I hope you have a wonderful day! beautiful cards! Thanks for the chance to win! I love your cards! So beautiful! I love this new stamp set. It is so adorable! oh my such cute cards, you did a great job with that set! Love your cards and this new stamp set. Enjoying the Blog Hop too. Both of your cards are terrific! They are so pretty and that stamp set is so cute! Beautiful!! I love this stamp set. Thanks for the opportunity to win! I really liked the 2nd card those were some nice scraps :) I love using my scraps to make cards what a great tip to use. You are such a talented lady!!! I love your cards they are beautiful. Thank you so much for sharing. Oh Lorie! You have made such cute adorable cards!! Am loving this new set! Love all the extras you have added to your cards--wonderfully wonderful!! Such cute cards. It is great to see the spins everyone takes using the same stamp set. So far your cards are my favorite. You did a great job. Thanks for opportunity to participate. Scraps are great and so are these cards! Love them both, you are very creative! These cards are just adorable. What a great inspiration. Precious as can be! You are a true artist, my friend! Your coloring never ceases to amaze me!! Beautiful cards! I love what you did with the puppy leash in the first card. Those cards are adorable. I love the way you have used thread for the little dogs leash. I love the colors of your creation! Very Spring/Summer. This stamp set is just adorable!! What great work! I love this new set it is super cute. you girls are all comin' up with the most wonderful cards! Love how you put both the puppy and dolly in there! Both cards are adorable, I love the paper you used, great scraps. I truly love your 2 cards. The first one is so precious and I love the color combination of both of them. Super great job. What fabulous work you did on these cards! Both are just adorable! LOVE them both!!!!!! They are soo cute!!! You did a great job!!! Lorie thanks for sharing two wonderful cards. I really like this stamp set! Such cute cards, what an honor for this... You ladies do amazing work. Thanks for sharing. Gorgeous cards. The colors are awesome. The little girl is too cute. TFS. What a wonderful set and amazing for all of you to dedicate it to a fellow DT Member. I love the cards and the colors are amazing. Hi, Lorie. I've been a baaad blogger lately, blurking but not leaving comments. :( You have been busy creating absolutely stunning projects!! Your coloring is amazing as always and the images are all so adorable. This Peachy Keen set is so happy and fun! Your cards are super stinkin' cute! I, too, love to use my left over scraps. I love grab bags...can't wait! WOW! I really like the second card!!! I love the colors, the layout, everything about it! TFS!!! This blog hop is fun. I love your work! What a cute set! I am loving the puppy! You did such a great job! I love the texture you put on her dresses! Awesome that you put the wagon and the dog on the same card, because how can a girl chose? Your cards are adorable. Thanks for the chance to win a prize. These are beautiful. I can't wait to make a card with this stamp set. I really love the second one... so cute. I really need to get some of these markers it sounds like! Your cards are absolutely stunning! I love how you colored them! I really love the detail you put in your cards, especially the little polka dots on the dress. You did an amazing job! Super cute stamp set! Your cards are adorable, thanks for sharing them. Oh my goodness... these are amazing! I need this set! hahaha... Thanks for sharing! Very cute cards - very cute stamp set that is for sure! Love them both - amazing! Both of these cards are just aborable! your whole team is just sooo amazing! you guys all use one stamp set but make it soo unique in your own way...tfs! This stamp set is so cute. Well Happy Stamping to you also. I love these cards the stamps rock and so does your whole team. Both of your cards are adorable!!! Great work! Both the cards are amazing! And love that you used all scraps! Oh wow!!! these are great!!! I love the shading you did on the dresses. This stamp set is just too cute. love your cards. Lorie - both of your cards are adorable! I love how you colored the dogs so differently. So very cute! These cards are adorable! My favorite is pink so I love the pink one the best. Awesome cards and I love the stamps!! I hope I win something from this great blog hop and if not I am certainly inspired! the cards are so adorable, love all the colors that you used, great job! & thanks for the give away! Beautiful cards!! You are so creative!! Thank you for sharing your gorgeous cards! I'm going to have to try those Copics. That's all I've been hearing about lately:-) Gotta keep on blog hopping! Even with scraps? You're killin' me Lorie!! Totally fantastic (as usual)!! That purple polka dot dress is my favorite. Can't wait to see you in action next month!! Thank you for all your help this weekend in explaining things to me...I'd definitely be lost without you!! Cute cards! I love how you added both the dog and the wagon with dolly. Very clever. Thanks for sharing! All I can say is How Adorable. Your cards are so cute!! The coloring on the cards are so great! I love the new stamps! Lorie, these cards are just adorable for sure. You are so talented! I love the use of the Copic markers. I really want to get these some day. Wow - what beautiful cards. You outdid yourself. It's amazing what you ladies did with this stamp set. I'm new to your blog - joined the hop after checking out Emma's blog for today. You're awesome. Thanks for sharing and the opportunity to win! Thanks for the chance, this blog hop is so fun! Super cute cards! Thanks for the chance to win! Love the cards! You must have great scraps in your stash! The cards are beautiful! Your cards are gorgeous. I'm in love with this new stamp set. It's a must have on my wish list. I simply adore you two cards! I cannot decide which one I love the best. They are both so soft and delicate! So beautiful in their own ways! I do love that pink leash on pup #1!! Im so lucky to be on this wonderful DT with such amazing talented ladies, like you!! Wow.. So far you women have blown me away. I am new at all this scrapbooking and card making. I am not sure I will ever get close to you talented people! Lol What a fun thing... Hop... Hop...Hop! These cards are amazing. Everyone is doing such a great job with them. Thanks for the extention. I thought I had missed out. The card is as lovely as the whole set - just like Viv! Wow! That is cool that you extended the deadline and added more candy to the pot! OMG! I love this stamp set and your cards are amazing! Beautiful colors and paper! Super cute cards! I love Viv walking her puppy. I love your cards. I love to make something great with my scraps as well. Great job! Love the purple and green card! woot woot- love what u did with the first card incorporating the dog & the wagon! U go girl!!!! The cards are adorable. Everyone has done a wonderful job! Forgot to leave contact information, so thought I would try to repost. The cards are adorable. Everyone has done a wonderful job. This is fun... Great fun! Great Job! I love your cards. Oh my goodness, Lorie! These cards are absolutely the most beautiful cards I've seen in a very long time! You are amazing!!! Lovely cards, i especially love the top one,and the colours and to think made with scraps, awesome!! Love these cards! You did an awesome job! These cards are just fabulous..Love how you did the little lease on the first one, just too fabulous. What cute cards!!! :) How did you make the flower on the 2nd one? Did you have a stencil for the clouds on the first? Just perfect! Lorie....I love your cards! I especially like the little girl in the purples dress--your colorful accents and just right on!!! These are SO SO CUTE!! You are adorable and these are DARLING!! Your artistry never ceases to amaze me. Beautiful works of art, my friend! The cards are so beautiful. Thanks for the giveaway. could have sworn I had commented on your lovely cards, hope I am not too late.